I have followed your integration instructions, but see no ads in my app. FlurryAds: No ads available from server for this unit. 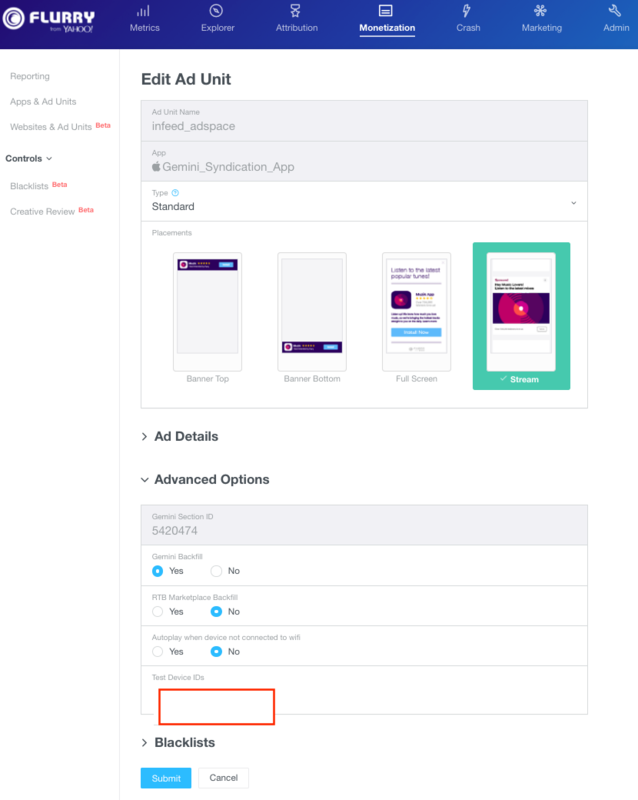 How do I display the sponsored icon/advertiser name when mediating native ads with MoPub? Take a look at the delegate callbacks that FlurryAdInterstitialDelegate or FlurryAdNativeDelegate when integrating interstitials or native ad units respectively, return upon calling fetchAd on the ad object. Each error callback provides the FlurryAdError and NSError description that you can look into to understand the cause for the failure to receive the ad object. 104 FlurryAdsNoAdsForSpaceError No Ads available for ad space. Try later. Or you can configure your ad unit to send the test ads to a particular device used for integration testing. To do so, on the flurry dev portal go to Monetization tab, on the left hand navigation bar select Applications & Ad Units, and select the ad unit in question. In the Advanced Options section, in the Test Device IDs field enter the IDFA of the test device where you are verifying the integration code. The (void) adInterstitialVideoDidFinish:(FlurryAdInterstitial*)interstitialAd delegate method will be called when a video finishes playing to inform the app that a video associated with an ad has finished playing. This method is invoked for the Rewarded (Client-side or Server-side) full screen takeover ad units only. The ad unit configured as the Standard ad mix will not invoke this delegate. The ad unit mix configuration is done on the server side, see further instructions: to integrate rewards into your app . If you are integrating Flurry ads in a UIViewController of your app then set FlurryAd delegate in viewDidAppear (instead of in viewWillAppear), do not set the delegate to nil in viewDidDisappear (instead of in viewWillDisappear). When the user clicks on the ad, the ad is expanded and the viewDidDisapear is called prior to the ad being opened in an another view. Also do not deallocate the ad object in the viewDidDisappear (or viewWillDisappear). The Flurry SDK is compliant with Apple’s guidelines related to the Limit Ad Tracking setting. The Yahoo Gemini branding logo is a custom property in MoPub. To show it in your layout for iOS, you will need to override the layoutCustomAssetsWithProperties:imageLoader: method in your implementation of the MPNativeAdRendering subclass.